Model of a reciprocal roof, made from natural materials. Despite the differences in diameter, a neat result is obtained. A reciprocal roof is a kind of roof in which every rafter is supported by the previous one, resulting in a strong, self-supporting construction. But what will be the angle of my reciprocal roof? That’s for many amateur builders generally a process of trial and error. However, it is rather easy to calculate this roof angle. Grab a calculator and join in. Usually a reciprocal frame will be covered in vegetation, so a relatively small angle is desired. 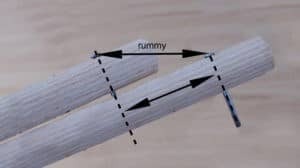 Only two variables have influence on the angle: the thickness of the timber and the so called rummy. The rummy is the distance between two consecutive places where two poles meet each other, measured horizontally. The picture will clarify. The smaller the rummy, the larger the roof’s inclination. So, by selecting enough length of the rummy, you will be ensured of a limited roof angle. The three pictures above further clarify the geometry of a reciprocal roof. Alpha represents approximately the roof angle of the entire reciprocal construction. The trick is to find alpha by applying some basic goniometry on the right-angled triangle. We’ll get back to that in a moment. With as little as three poles a reciprocal frame can be constructed. Note that the central opening has the same number of corners as there are poles. The circumference of the central opening is obviously dependent on the size of the rummy and the number of poles. The length of the contour is simply the rummy times the number of poles. The diameter of the central opening is more or less the circumference divided by π (3,1415). As the number of poles increases this approximation improves, because the central opening approaches a circle more and more. In the most extreme case the reciprocal frame consists of just three poles which leads to a triangular central opening. However, the diameter of even a hexagon is well approximated by taking six times the rummy and divide the result with π. When using a high number of poles for a reciprocal frame, the central opening will probably get to large. Decreasing the rummy is not an option either, because this will increase the roof angle. The best option will then be to make a notch every time two poles meet. The effective diameter will thus be reduced locally and the roof angle will decrease subsequently. Still the key question remains: what will be the roof angle? Get your calculator, enter the (effective) pole diameter and divide by the rummy. Now take from the result the inverse sine (arcsin of sin-1) and there you have it: the roof angle in degrees. Make sure your calculator is actually set on degrees (deg). Alternatively, you can also use this small Excel sheet. By taking a small rummy the roof angle increases sharply. Although the number of poles influences the size of the central opening, it hardly changes the roof angle. It could change in the order of a degree because the poles will meet slightly different at varying numbers of poles, but that’s it. The roof angle is also not affected by the length of the poles. The load of a reciprocal roof on the wall below is definitely favourable. Once the roof has settled in its definitive position, the weight only works vertically on the wall. So, the wall does not encounter outwards directed forces. In the middle of the construction each pole rests on the previous one. Even without any fixing a reciprocal frame can be stable. Especially when using a larger number of poles the frame will remain standing. In actual construction a sturdy fixation is recommended, but it illustrates the intrinsic stability of a reciprocal frame. Many reciprocal roofs are build with round wood. Posts are stronger than square or rectangular timber. 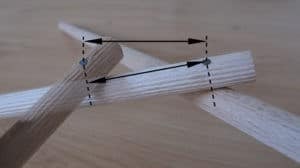 An important advantage of round wood is that the fiber structure is nowhere cut. This yields more strength at the same weight. How do you calculate the diameter of a pole? For example for a ground surface of 60 m2, hexagonal shaped construction. This depends on a lot of factors. The kind of wood, the number of rafters. 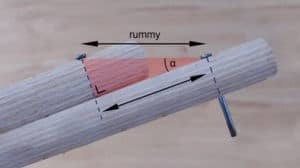 Rule of thumb: de diameter should be 1/20 of the length from wall to the point where the pole / rafter meets other rafters in the middle. So, is this distance is 4 meters, the diameter of the pole should be 4 / 20 = 0.2 metres or 200 mm. However, in the case of a vegetation roof, larger diameters may be needed. Good article. I have a 20′ diameter octagon. I am using your excel sheet to calculate the diameter of the center octagon using 8 rafters (4″x4″)I would like it around 3-4′, but I am weary of the roof angle, as I live in a heavy snow load area. I would like a larger roof angle, with a 3-4′ opening using 8 rafters, but cant seem to make it work on the spreadsheet? Also, I am curious how to determine the length of the rafter? Well, the roof angle follows solely from the rummy and the diameter of the rafters. So, a certain roof opening combined with a certain pole diameter will give a certain roof pitch. A steeper roof angle will give a smaller central opening. Let me know if you need any help with this. And sorry for the late reply! Hello, I would like to know if this type of roof can withstand a cyclone. I live in an area concerned by this kind of phenomena. I am looking for links to understand how to do it! In French if possible! A reciprocal roof in itself is not better or stronger during a cyclone. However, the round shape and the lack of vertical parts does help in strong winds. Strengthening the frame as a whole can improve its characteristics in strong winds. Anchoring everything well is another point of attention. But these are just a few of the aspects you need to take into account. I would say a local expert best have a look at the plans!